now, i don’t personally eat gluten-free, but i made these for a good friend several years ago who had just had a baby – her husband eats gluten-free and we were taking over brunch. these turned out so well (read: they were devoured by both adults & kiddos within minutes), i decided to post them on my non-GF food blog. they do require some specialty ingredients (i had no trouble finding them) but it is well worth it if you are wanting something GF for your family or to take to a friend. who will thank you for days. *april of 2016 i edited this recipe to make it whole30 friendly – cuz that is our life this month 🙂 my adapted version here is gluten-free, paleo, and refined sugar-free (only date syrup used, which has no added sugar). i also omitted the vanilla extract because it is made with an alcohol base, which is not whole30 approved. the date syrup and the cinnamon give them so much flavor, i didn’t even miss it. even with these changes, Y’ALL. they were totally awesome! 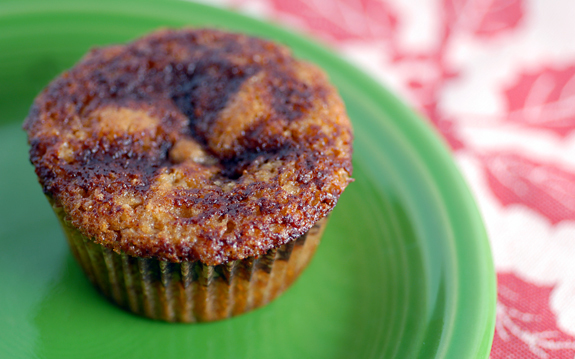 if you want the original gluten-free recipe via elana’s pantry, just click here. 1. line 9 muffin cups with liners or spray with cooking spray. preheat oven to 350. 2. in a small bowl, whisk together all 3 topping ingredients and set aside. 3. in a large bowl, combine almond flour, coconut flour, baking soda, and salt and whisk together. in a separate bowl, whisk the eggs then add oil and date syrup. stir well to combine. 4. mix together the wet & dry ingredients until well combined. scoop about 1/4 cup of the batter into each muffin cup, then with a spoon, drizzle topping on top. 5. bake muffins for 13-15 minutes. once baked, allow to cool at least for an hour before serving (or they’ll fall apart).